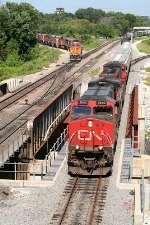 Title: CN 2640 at Mile 260 Kingston Sub. Description: Empty grain heads north with CN 2640 and CN 5620 running elephant style. Description: Lots of interesting power in Enola today, including two SD9s, CN and CP engines, and one of the RP20BD's. 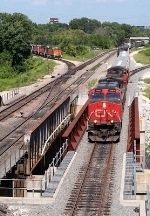 Description: A CN train arrives via the Belt Line while the pre-owned train waits for a UP train to clear. Description: The pre-owned train on the move toward the yard. 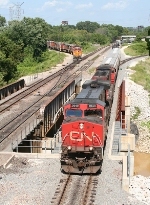 Description: The CN train crosses Nonconnah Creek on new bridge built during yard rebuilding. 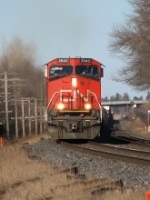 Description: Pre-owned train approaching crossover while CN train moves slowly. Description: The pre-owned train went to far to throw the crossover. He had to backup to throw the switches the came on toward the yard. 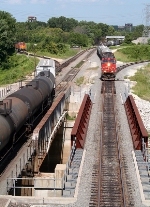 Description: A CN Track Geometry Train heads north on the McComb Sub at Fkuker, LA. Description: A CN Track Geometry Train with FRA insection car DOTX 217 in tow, heads north on the McComb Sub.